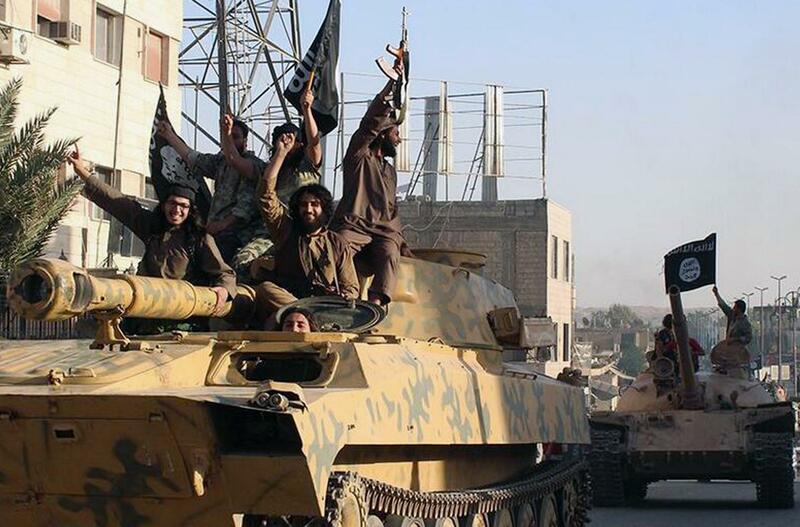 Fighters from the self-declared Islamic State parade through Raqqa, Syria, in June 2014. Some NPR listeners and NPR.org users have questioned why the qualifiers are still being used. As Weekend Edition Saturday host Scott Simon wonders, wouldn't people still know who we were reporting about if we didn't include a "self-declared" or "self-proclaimed"? Yes, most listeners and readers would not be confused at this point. But, as we talk about in our latest "Word Matters" segment and as is explained here, NPR editors believe it is still important to add the extra words. The primary reason: Not adding expressions such as "self-described" would by omission imply that the organization is a "state," when in fact it is not an "independent government ... within defined borders." Those are key parts of the word state's definition. -- The overuse and misuse of the word "countless." In the past year, for instance, the word has been heard on NPR's airwaves more than 110 times. Most of the references have been to things that can be quantified, at least roughly. Did any 2014 congressional candidate, for instance, really visit "countless community festivals, civic group meetings and even a couple of high school football games," as we reported? -- The "NPR Grammar Hall of Shame," and in particular the problem that we heard about most often when we asked the NPR audience to tell us about grammatical mistakes they come across every day. The No. 1 gripe, as we've previously posted about, concerns misuses of "I," "me" and "myself." If you would like to take the "I or me" quiz we created earlier, we've attached it to this post as well. We're joined now by Mark Memmott. He's NPR's standards and practices editor. We asked him to join us to talk about some of the language choices that get made on NPR. Mark, welcome back. MARK MEMMOTT: Thank you for having me. SIMON: Let's begin by asking about a group of people who are in the news just about every day lately for months. We're going to play some audio. ROBERT SIEGEL: The self-proclaimed Islamic State. UNIDENTIFIED REPORTER #1: The group calling itself the Islamic State. MELISSA BLOCK: The so-called Islamic State. UNIDENTIFIED REPORTER #2: The self-declared Islamic State, or ISIS. SIMON: At this point, what's the idea behind so-called? MEMMOTT: Well, we don't want to mislead listeners or web users who, over the years, have heard us refer to the Islamic Republic of Iran, Islamic Republic of Afghanistan, or other nations. But more importantly, we want to be accurate, not adding words such as self-proclaimed, self-declared or self-styled could make it appear as if it's settled that this group is a state. But in fact, it is not an independent government within defined borders, which are very important parts of the word state's definition. SIMON: When we sometimes let it drop, and you've probably noticed that every now and then on live broadcasts we do, is that OK? Do people still know what we're talking about? MEMMOTT: I think they do. It's not the worst thing we do on the air. And there does come a time in these ongoing stories where newsrooms conclude the audience doesn't need as much expository information as it once did. You mean, you don't hear long windups about what al-Qaida is, for instance. It's pretty much assumed people know by now. But we feel that this is a case where we still want to remind people and we still want to be very clear this is not a state in terms of a formal government. SIMON: You brought us another word to reconsider this week - one that we've heard countless times. And by that I mean it's countless. MEMMOTT: Yes, and I'm sure we will again today at some point. I don't want to make it seem like we're the only media outlet that's guilty of this, but we certainly do seem to find a countless number of things that listeners must hear about. I've got some figures. The word countless showed up on NPR.org 255 times in the past year. It was said on our air at least 112 times over that same period. SIMON: Mark, forgive me. Let me interrupt. So you counted the countlesses. MEMMOTT: I did count the countlesses. MEMMOTT: They could be counted, which is an important part of the definition or what I want to talk about. The problem is it starts to lose its meaning when we use it so much. And the things that we say are countless almost never really are. We declared in a headline, for instance, that Lauren Bacall lived a countless number of lives because she had reinvented herself about a dozen times. A dozen doesn't seem like countless to me. We said on the air that Randy Jackson, the American Idol judge, had played on a countless number of albums in the '80s and '90s. I bet we could've come up with a number. SIMON: Yeah, late last year we asked our listeners to name what grammar or language that just irritates them the most. What did you hear from them? MEMMOTT: Well, me and you really need to talk about this. MEMMOTT: And yes, I know what I just did. I mean, I sifted through about 2,000 emails, Facebook posts, tweets, online comments about grammar bugaboos. They divided up into about 270 distinct complaints and the number one issue on folks' minds was the misuse of I, me and myself. It really irritates many people to hear someone say something like please talk to Jane and I before you leave. Just remember this - you wouldn't say please talk to I. You would say please talk to me - pretty simple. If anyone wants to learn more about what bothers people, they can search on the phrase grammar hall of shame at NPR.org. But I might want to add - can I add one thing? MEMMOTT: We do need to keep this all in perspective. English is a living language. Many of the mistakes we hear about may turn into wonderful new usages. I heard from Tom Roberts, he's a linguistics fellow at the University of Maryland, who emailed to say - and I'm quoting him here - "when enough people are misusing a word, we are witnessing something miraculous, not misuse, but a new use." He suggests we celebrate those changes. I like the spirit of that message, though I'm still going to be a nudge about the countless grammatical mistakes we come across. SIMON: That's your job. Mark Memmott, who's NPR's standards and practices nudge - or editor's all right? OK. And you can send him your pet peeve, by the way, to word matters - all one word - @NPR.org. Mark, thanks very much.